Green CC is costume, the other colored variations are normal or so they have been. Astra will be out of the office for a while. Quickest way to fix this is to turn all creative headgears into the costume versions. Edited by VanishingPoint, 31 August 2018 - 08:50 AM. I never chose tho so ooh well =="
Title, VIP and hat prizes (winning and participation) should be in. The title must be claimed from the achievement tab. Edited by KriticalAssassin, 31 August 2018 - 09:59 AM. Mine wasn't in after maint. I'm gonna check now, just got off work. Thx for the hat! didn't knew not all CC's hat are costume. 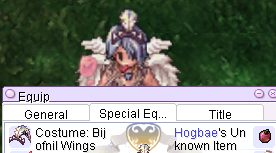 Got my hat, but the Angel Ear Wing is bugged. Will check with Campitor, in future please report such bugs in the tech section, I scan that area more often . Ooo okok. Forgot where I was supposed to report this kind of thing. "Though the prizes listed are unique to this contest for now, it is not intended to be permanently exclusive to this event, and may be used, sold, or offered once again in the future should the need or desire arise. " why can't I deal this HG to another account? Edited by diikhlaskan, 31 August 2018 - 06:54 PM. I just recently learned that only Green is the costume version. Waiting for Camp to exchange my Blue to Green. Edited by LeeKelly, 01 September 2018 - 04:36 AM. I chose the Blue CC too... if its not costume can i have the Green one instead ? Edited by lenz20200, 01 September 2018 - 03:03 AM. Participants! Your prizes should be going in your characters within the next few days. Winners! Your hat prizes will go in the same way, at the same time as your participation prizes. Your VIP should be activated by the weekend, and it will be on the same account as the character you received your hat prizes. Additionally, you should all get your Winner Titles after maintenance. I will be out of the office for a week, so any winners who did not tell me their preferred prize, please PM your concerns to Campitor and he will handle it more quickly. Yes, contact Campitor in private. Link in your entry and your request. The requests will be looked into early next week, hopefully. Hopefully that sprite fix too. I loved the crafting this year, really neat stuff. I have not receive my costume and title yet, but other winners already got it. Not any respond from camptitor too.